JOB RESPONSIBILITIES • Ensure proper implementation of all engineering aspects of projects. • Regularly communicate with clients, suppliers and other relevant parties in order to understand different perspectives and meet technical, quality, health and safety standards. • Provide information to the management in a timely and an accurate manner. • Constantly monitor company maintenance procedures and ensure preventive actions are taken by relevant personnel. • Provide guidance to teams involved in maintenance activities of the MHEs and other warehouse equipment. • Engage in pre tender and post tender administrative work. • Participate in the preparation of annual budgets to identify and forecast resource requirements. CANDIDATE PROFILE • A minimum of 3 passes at GCE A/L. • Bachelor’s degree or equivalent professional qualification in civil engineering. • Thorough knowledge of AUTO CAD. 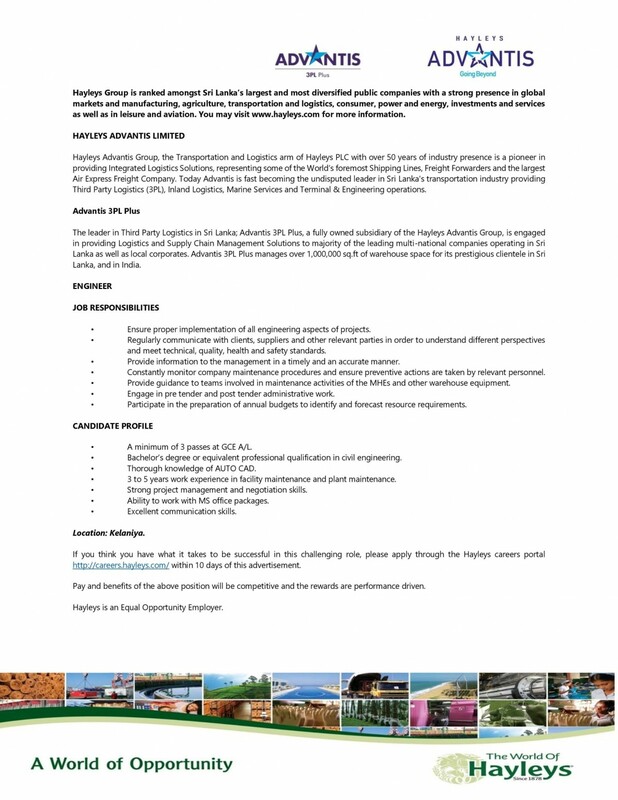 • 3 to 5 years work experience in facility maintenance and plant maintenance. • Strong project management and negotiation skills. • Ability to work with MS office packages. • Excellent communication skills.